I told you I was going to try and post some simple sewing tutorials so here I am and I promise anyone can do this. It’s an easy tea towel tutorial that can actually be a no sew OR sewing project. 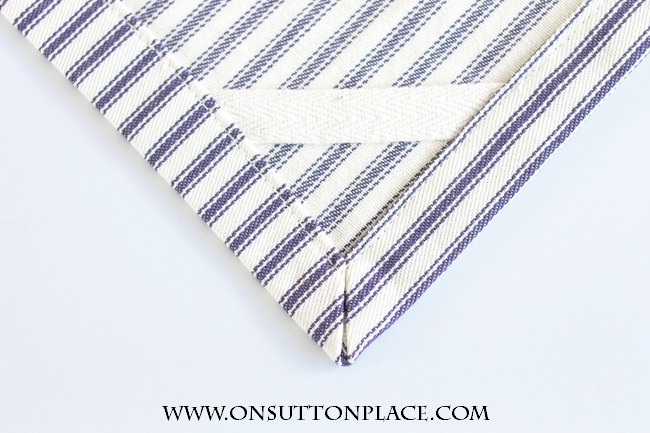 The no sew version will work if the tea towel is not going to be used on a daily basis. “Just for show” as my mom used to say. Both start with cutting a piece of fabric 22 in. x 30 in. You can, of course, make it any size you want but these measurements will give you a nice, generous towel. On your ironing board, press the raw edges of the long sides over 3/4 in. Next press the raw edges of the short sides over 3/4 in. 2.) Starting with one corner, fold it over making sure the fold line is where the sides come to a “V.” Press well. 3.) Trim the tip of the corner off with sharp scissors. 4.) 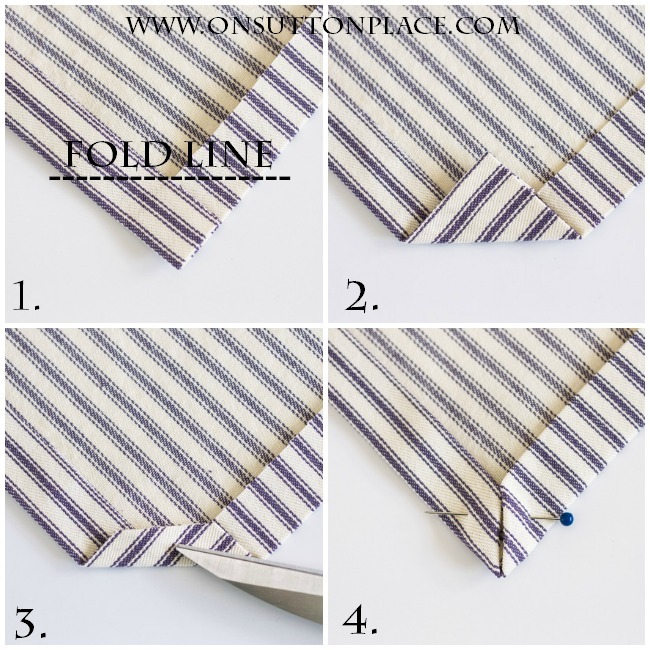 Fold the sides over again making sure they meet at a diagonal in the center of the corner. Press the corner and sides well. Insert a pin to keep the corner in place. Continue around the towel until all 4 corners are mitered. The first corner or two might be little challenging, but after that they will go very quickly. All it takes is a tiny bit of practice. For the sewing method: insert the towel in your sewing machine and stitch all around it making sure to catch the mitered corners. It’s a nice custom touch to add a piece of twill ribbon to one of the corners as a hanger. This is totally optional. Of course I feel obliged to recommend the sewing method over the no sew method simply because it’s sturdier and stronger. If you don’t sew, by all means use the fabric glue. Your towels should stand up to at least a few washings. 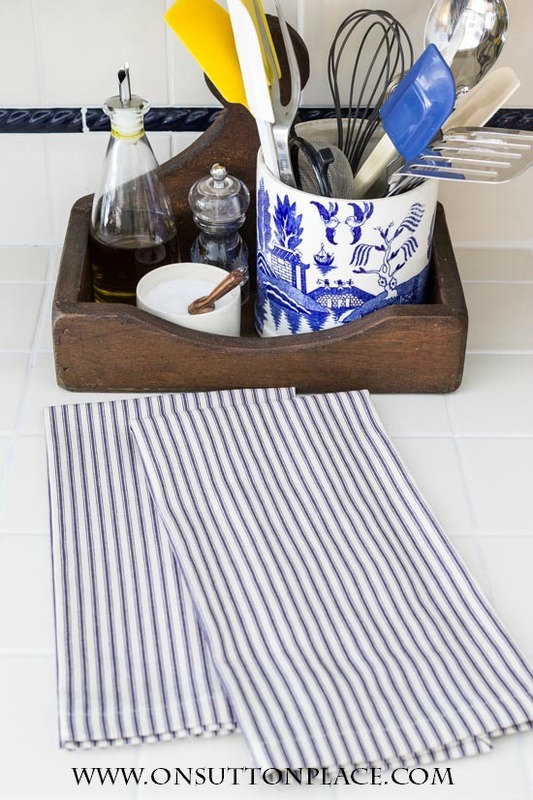 These little towels are the perfect way to add your personality to your kitchen or powder room. Pick out fabric that reflects your style and give them a try! I really got into tea towels before Christmas, so many possibilities to add personal touches and great gifts. I notice when I buy tea towels from the store, some wrinkle more than others. I always have to iron them, what kind of blend of fabric do you use? I just washed a table runner a friend gave me for Christmas. It was made from cotton. Unfortunately she used some type of iron on tape and it all came undone. I had never heard that you can’t wash the iron on tape, and it certainly wouldn’t be good for towels that you would be washing regularly, unless they are just a decorating accessory. I’m sorry about your table runner. Some iron tape is not permanent. The Aleene’s I linked to above is pretty good but like I said in the post, it might only hold up for a couple of washings. Definitely use the sew method if anything is to be used regularly and washed. OK now I want some, those are darling and how easy. Pinning! Thanks looks simple,when my children were young i sewed a lot of their clothing, but just want easy. So,thanks for all the easy things you post for us,i truly appreciate them. Hi Ann, thank you for the tea towel tutorial. It was very clear the way you did with the pictures! You have a beautiful home , and I love your blog. Beautifully done. Neat, professional, classy all the way. Good job! Thank you! Thank you Ann for another great tutorial! You are the best! Well, Ann. This is so kind of you to share the tea towel tutorial. I have always wanted to learn how to miter. Now I know thanks to you! Ann…I noticed your utensil holder is Blue Willow. When I was little, a lady taught me the poem about B,he Willow, I thought you might enjoy it. Three little men going to Dover..
A willow tree is hanging over..
A sailing ship is sailing by..
Two TURTLEDOVES are flying high..
An apple tree, with apples on..
And picket pailings all along. These are great Ann and a super tutorial. I used to teach sewing (Home Ec is what we used to call it!!!) and am so glad to see you emphasis the pressing! I think that is the difference in things looking professional or homemade. 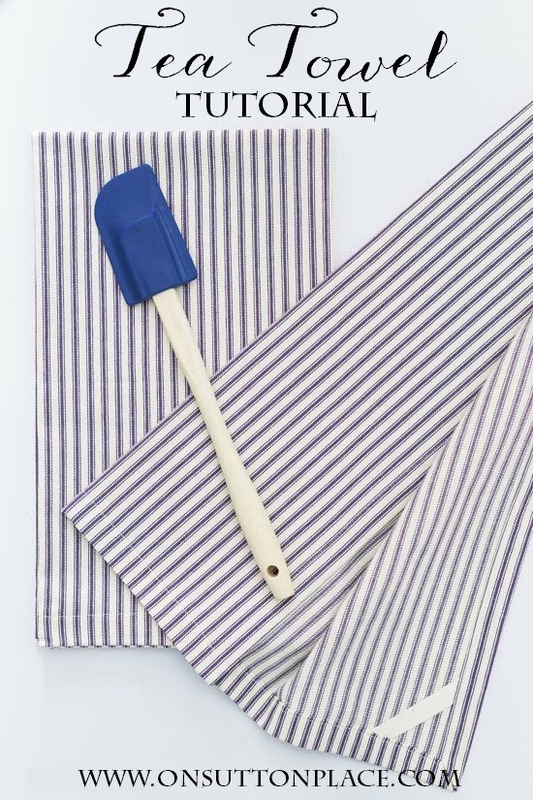 Love the ticking stripe too! Great tutorial, I can do this!!! Oh, thank you so much! I’ve always wanted to know how to make mitered corners. This will work equally well for making cloth napkins. Great post today! Yes perfect way to make cloth napkins. Enjoy! How well will the ticking stand up to bleach when laundered? I would not recommend bleaching ticking. I have never tried so I can’t say for sure but my guess would be that it would fade. If you want a bleachable fabric perhaps try white cotton or pure white linen? Good luck! That’s too bad, I love the country look of the ticking. I may throw a scrap in the next whites load to check the results. Or as you say use them “Just for show”.. Thanks, Love your blog. I did the best I could with my explanation. The pictures actually work better than the words. Once you get started it will all make sense! I am not a sewer but want to try making some straight valances which will hang with clips. As soon as I saw your tea towel tutorial, I realized that making these would be an awesome way to practice before I touch my valance material. I also wanted to tell you how much I LOVE your blog. Your projects and recipes are for real people and are easy to make and complete. . Thanks for all you share! Hi Susan! This is the perfect method for making valances. You are brilliant…good luck and have fun! Dear Ann, your way of projecting your tutorial is easy to understand. No fuss. Also reading your readers’ comments add additional point of view in looking at your project. I enjoy and saved it. Pl. keep sending new projects. All the best.